Can People with Disabilities Try Paragliding? Since its invention in the 1980s, paragliding has become hugely popular. It’s easier and cheaper than other controlled flight activities like hang gliding. Even absolute beginners can usually get up in the air on their first day. But can people with disabilities paraglide? If you can’t see or hear, or are unable to use your arms or legs, paragliding may seem exciting but impossible. But in fact, almost everyone can enjoy paragliding. New technologies and increased attention to the issue during the past ten years mean that people who once thought that paragliding was out of reach are now taking to the skies. People with disabilities can paraglide with a variety of options. The best way to start, is a tandem paragliding flight with an experienced instructor. Deaf people, blind people, those who use wheelchairs, and people with other physical disabilities have all flown with assistance. In fact, this is how all beginners start. And disabled participants aren’t just passive passengers – they get to help steer and direct the flight. With the right program, many students soon end up making solo flights. Paragliding enthusiasts with extreme hearing loss have found various ways to cope with the problems associated with deafness. They develop visual signals to communicate with instructors and other flyers, and learn to judge wind speed by feel instead of sound. Similarly, blind students have learned to paraglide with the same aptitude as sighted students by coordinating with an instructor via radio. Many people who are wheelchair-bound have found that paragliding is the perfect activity for them, because the canopy is controlled entirely by your arms. For those who use a wheelchair because of an injury, or due to conditions like cerebral palsy, this can be a big thrill. The biggest problem was how to get a wheelchair in the air. In 1997, a group called Flyability in the UK designed a wheelchair for both everyday use and paragliding. To make the chair flyable, a harness is attached and an extra wheel is added in the front. 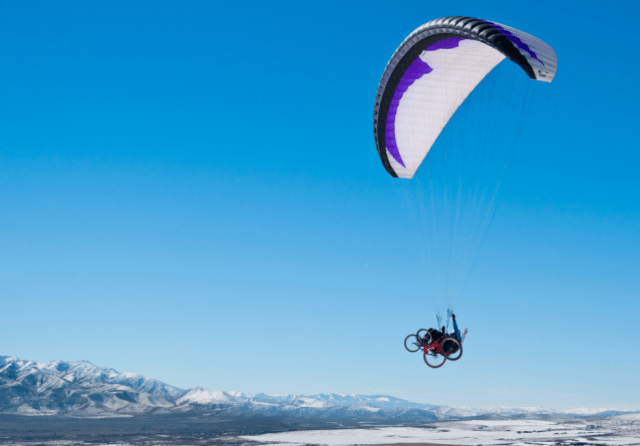 In 2010, paragliding enthusiasts in the US and engineers at the University of Utah also developed a specialized wheelchair just for paragliding. These new wheelchairs had space for an instructor, meaning that wheelchair users could train to be pilots. As a result, people with spinal injuries were soon flying solo. For many US veterans who have lost the use of their legs, paragliding has been therapeutic. On the one hand, it’s a great adrenaline fix. On the other, it gives them a sense of freedom they don’t always feel on the ground. The best part about it: the sky is one place where your legs don’t matter! If you need any more proof that anyone can paraglide, look at the story of Vincent Delepeleire. A paraplegic, Delepeire spent the summer of 2014 crossing the Alps via wheelchair and canopy. Crossing the 620-mile course of the Alps is no small accomplishment even for those who have full use of their legs. But Delepeire will be the first disabled person to paraglide the route. We’re all equal in the air!